No one could resist playing a good ol' poker game where they get to see all the cards laid out on the table and see if they will provide you with a winning hand or not. The adrenaline of getting the highest combination from their cards, and winning against the dealer is something that can get any player's heart racing with excitement. But what could get their heart racing even further is playing a poker game with an interesting twist. 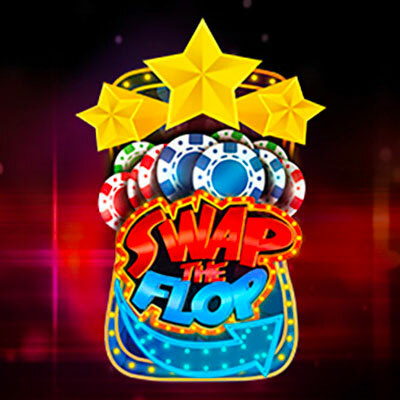 Brought to you by Seven Deuce Gaming, Swap The Flop brings an unusual set of rules to the table, which is added with a level of exhilaration and a big chance of making large winnings at the end of each game. If you're a fan of other poker games like Texas Hold 'Em, then you will definitely fall in love with Swap The Flop! There's nothing more great than hearing about a gaming developer that got into the industry, just because they have a deep interest and fascination in technology, not to mention the desire to cater to the future generation! Seven Deuce Gaming has been in the business for many, many years, and have 2 offices based in Sri Lanka and the UK, where they bring all of their creative team members together and bring all of their ideas to life. After looking at some of their previous successes like All-In Poker Split, Double Ditch Hold 'Em, and Texas Switch, you can be rest assured that you'll receive the high quality entertainment and winnings from Swap The Flop! The virtual table that loads up on your screen will give you the sensation of actually being in a live casino. Don't worry about the screen being cluttered because all of the important buttons, like the swap and bonus button, will be placed at the bottom of the screen, just underneath the table. You'll be playing against the dealer, and the goal is to get a higher combination than the dealer. So, you won't have to worry about any other players that would compete with you. The dealer will have 2 cards placed at the top of the table, there will be a space for 5 cards set at the centre, and you'll have your own 2 cards set right in front of you. The 2 cards that you'll have will be facing up, and you'll make the decision to either play with that hand or make a swap. So, what will happen if you decide to hit play or swap? Play: The dealer will turn his cards over, and then 2 other cards will be added to the table. The outcome will be shown instantly. Swap: 3 cards will be swapped at the centre of the table, and the game will end when the dealer hand turns over along with the 2 remaining cards. When you hit swap, your bet is distributed on 25% of the ante bonus, and 75% of your total bet. If you get a flush or higher, you'll the ante bonus regardless of the dealer's hand, along with an increase in the bet. Flush: 4x of the bet. Full House: 5x of the bet. 4 of a Kind: 10x of the bet. Straight Flush: 100x of the bet. Royal Flush: 200x of the bet. On the bonus bet, you'll get paid on any pre-flop or air. 1 of any Ace: 3x of the bet. 22-TT: 5x of the bet. QQ: 15x of the bet. KK: 20x of the bet. AA: 30x of the bet. The rules of this table game could throw you off a bit, but they're pretty simple to follow, so you'll be able to get the hang of it within an instant. The large RTP rate goes over a whopping 97%, which is pretty huge when you compare it to a lot of the other iGaming products that you'd have played at casinos online. Do you have some free time after work, or after you've done all of your house errands? Make your wallet feel heavier than usual by turning on Swap The Flop and playing it on your favourite device today!